For who is an extra ticket? 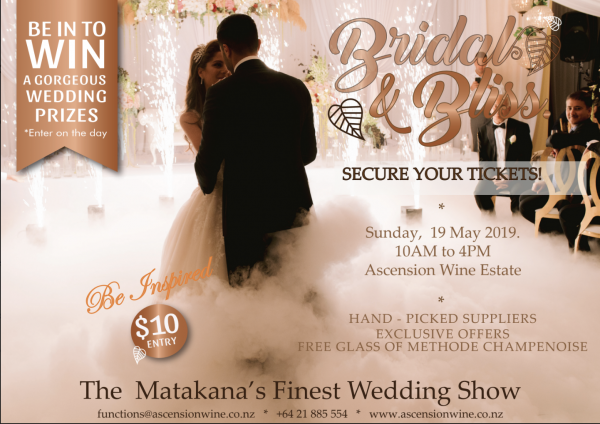 The Luxury Wedding Fair is a stylish wedding event taking place at Ascension Wine Estate (Matakana) on 19th of May 2019. The event will showcase hand-picked wedding specialists including Mike Steffens, HAP Film, Jenny’s Bridal and others. Bridal&Bliss Show is giving brides and grooms ideas and inspiration at an unsurpassed level to create their perfect day. We are proud to welcome you, to be part of our annual unique Wedding Show. Our award-winning Premier Estate and Venue has been refined to host the ceremony, photos, canapés and reception all at one unique location, among the wines. arise with planning the wedding day. Each year we host our very own wedding fair, providing couples with more than just information.